Side Rails, same as production. Expand your 2008-2012 KK Liberty's cargo hauling capacity. 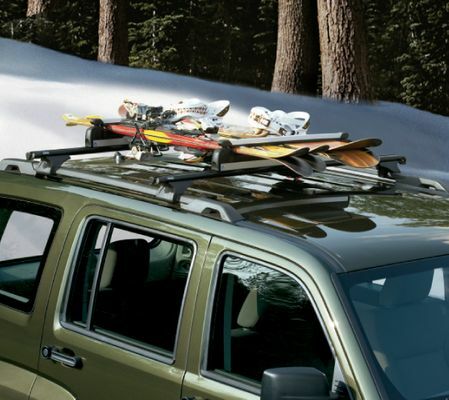 Supports installation of Mopar's Sport Utility Bars, cross bars, and certain roof basket products. Complete with installation kit. Black, Set of 2 side rails. Taking the old one off, no big deal. Install the new ones, no big deal. The big deal is trying to get all that rubber crap off the roof without scratching it. ProsPops on easy. A box wrench works fine. ConsNeed a long 15mm socket. Easy to install all really improve the look of my jeep. I got them to add a kayak carrier to my jeep and they work like a dream! Highly recommend. Received it quicker than expected..excellent quality!...easy install! Easy to install but be carefull with the cap covers. They crack pretty easily if mishandled. I think it was my fault. I put the caps on but then wanted to crank on the bolts one more time to be sure it was snug and when I tried to pry the caps off it got a crack in it. Bummed but the cap still fit on nice and snug. I might run a bead of super glue or epoxy on the crack. ProsLook good. Bars are well made. ConsThe cap covers are a bit thin so handle with care. Perfect fit , fast shipping. ProsFast shipping Fair price Perfect fit Fantastic Customer Service to verify I was buying the right one. ConsNone with the product. Be advised the Liberty's 'fake' rails are held on with adhesive that does not come off too easily....lots of elbow grease does the trick. New rails go on easily and look as they should. Fits on the 2012 Liberty factory studs as it should. Arrived quickly and fit my 2010 Jeep Liberty perfectly. Extremely simple installation. Have not installed cross bars yet, but these are a perfect, sturdy fit. Would purchase again. Came well packaged. Product exactly as described. Clear instructions and easy to fit.